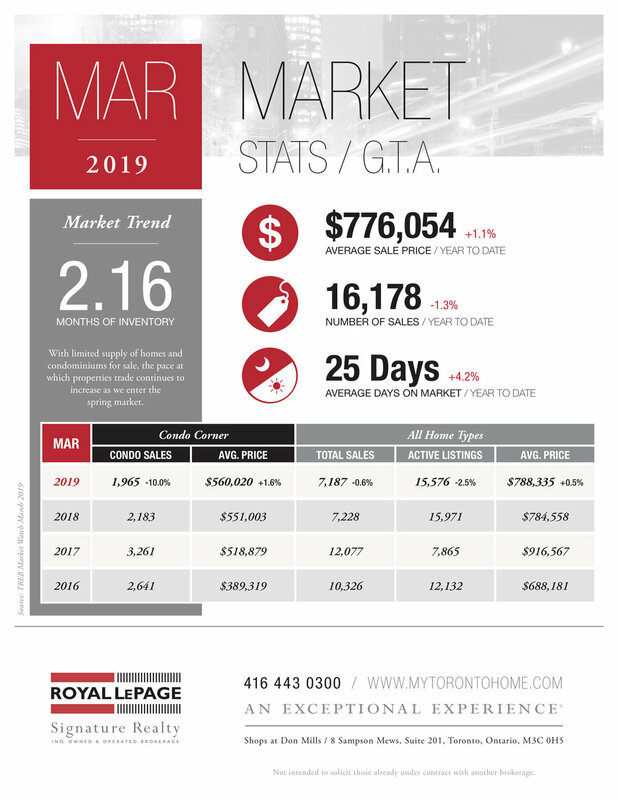 March 2019 market stats are here! The average sale price for the month was $788,335, up 0.5% compared to March 2018. Toronto Real Estate Board President Garry Bhaura announced that Greater Toronto Area REALTORS® reported 7,187 residential sales through TREB’s MLS® System in March 2019. This result was inline with 7,188 sales reported in March 2018. For the first quarter of 2019, sales were down by one per cent compared to Q1 2018. While March and Q1 sales remained relatively flat compared to last year, new listings have declined more so than sales. March new listings were down by 5.1 per cent year-over-year and Q1 new listings were down by 1.5 per cent. The MLS® Home Price Index Composite Benchmark was up by 2.6 per cent year-over-year in March, while the average price for March sales was up by a lesser annual rate of 0.5 per cent to $788,335. The average selling price for Q1 2019 was up by 1.1 per cent year-over-year. “Market conditions have remained tight enough to support a moderate pace of price growth. Despite sales being markedly lower than the record levels of 2016 and early 2017, the supply of listings has also receded. This means that in many neighbourhoods throughout the GTA, we continue to see competition between buyers for available listings, which provides a level of support for home prices,” said Jason Mercer, TREB’s Chief Market Analyst.. If you’re thinking of making a move and would like to know how we can help, please contact us or more info. When Does The Spring Real Estate Market Actually Begin? The answer to the above question depends largely on who you're asking. Speaking as a Realtor I'd say that the spring market actually starts as early as January. None-the-less there's activity in January and it's certainly the start of a market that will grow over the coming months. Many feel that the spring market doesn't really begin until the month of March. There's some truth to this in the sense that March is generally when we start to see signs of warmer weather and buyers are more apt to tour the neighbourhood for open houses. March is a little tricky though, as a number of buyers, sellers and realtors aren't fully participating due to commitments associated with "March Break". At least those with families anyway. I would say that the week after Easter Weekend is when the spring real estate market fully blooms and enters its busiest phase. A number of sellers wait specifically until after Easter to put their property on the market. And a number of buyers wait until then to kick their search into high gear. Regardless of when the spring market actually starts, we're at mid-April now and things are quite active. And they'll remain so for the coming months. The summer market of course! If you’re thinking of making a move and would like to know how I can help, feel free to contact us for more info. February 2019 market stats are here! The average sale price for the month was $780,397, up 1.6% compared to February 2018. Toronto Real Estate Board President Gurcharan (Garry) Bhaura announced that Greater Toronto Area REALTORS® reported 5,025 homes sold through TREB's MLS® System in February 2019. This sales total was down by 2.4 per cent on a year-over-year basis. Sales were also down compared to January 2019 following preliminary seasonal adjustment. "The OSFI mandated mortgage stress test has left some buyers on the sidelines who have struggled to qualify for the type of home they want to buy. The stress test should be reviewed and consideration should be given to bringing back 30 year amortizations for federally insured mortgages. There is a federal budget and election on the horizon. It will be interesting to see what policy measures are announced to help with home ownership affordability," said Mr. Bhaura. Despite sales being down year-over-year, new listings actually declined by a greater annual rate. This suggests that market conditions became tighter compared to last year. Tighter market conditions continued to support year-over-year average price growth. Both the MLS® Home Price Index Composite Benchmark and the average selling price were up modestly on a year-over-year basis in February 2019. The MLS® HPI Composite Benchmark was up by 2.4 per cent year-over-year. The average selling price for all home types combined was up by 1.6 per cent over the same period. Price growth was driven by the condominium apartment segment and higher density low-rise home types. On a preliminary seasonally adjusted basis the average selling price was down compared to January 2019. "Home sales reported through TREB's MLS® System have a substantial impact on the Canadian economy. A study conducted by Altus for TREB found that, on average, each home sale reported through TREB resulted in $68,000 in spin-off expenditures accruing to the economy. With sales substantially lower than the 2016 record peak over the last two years, we have experienced a hit to the economy in the billions of dollars, in the GTA alone. This hit has also translated into lower government revenues and, if sustained, could impact the employment picture as well," said Jason Mercer, TREB's Director of Market Analysis and Service Channels. "Semi-detached is fine, but we're definitely not interested in houses that are attached on both sides." I hear this from clients all the time, but I always try to get them to at least consider the potential of a row house before writing it off completely. Some buyers are more open to the idea than others. Aren't row houses narrower than semi-detached? I've been in row houses that feel remarkably wide inside. 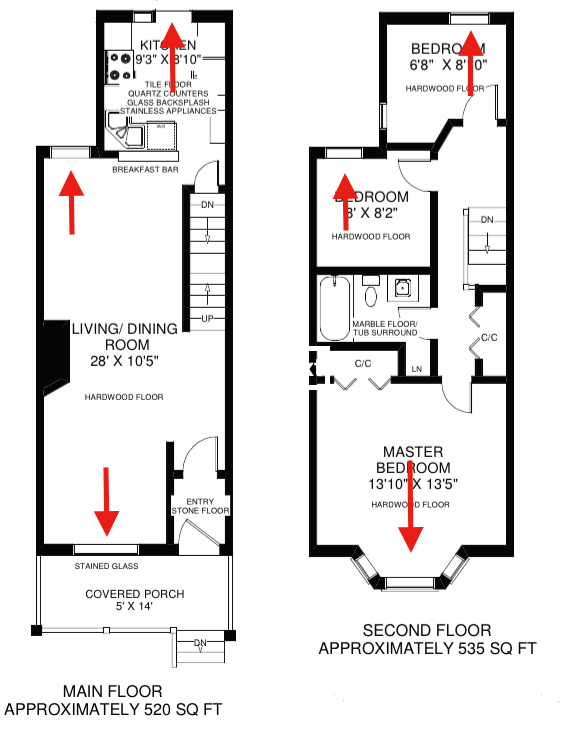 Clients of mine recently bought a row house in Leslieville, primarily because the main floor was so wide & spacious. We had already seen plenty of semi-detached homes in the area, and this row house was wider than any of them! My clients were able to scoop it up relatively quickly and at a fair price, in part I think because it was a row house. It simply flew under the radar of the competition. Aren't row houses darker on the inside, compared to semi-detached? Take a look at the floor plan below (paying attention to where the windows are), and keep in mind that this is a very common layout for semi-detached homes and homes that are attached on both sides. Note that every room has a window, including the rooms that sit in the middle of the house (the dining room on the main floor, and the middle bedroom on the 2nd floor). With this floor plan, regardless of whether the home is semi-detached or attached on both sides, the amount of light coming into the house is essentially the same. Like I said, some buyers are more open to the idea of a row house than others. I've had plenty of clients flat out refuse to look at them. "I don't want to live with neighbours attached on both sides." "The only access we'll have to the backyard is through the house." Fair enough. To each their own, and these are all valid objections for some people. If you can get past these "negatives" though, some row houses really do have a lot to offer. If you're thinking of purchasing a semi-detached or row house, please contact us for more info. January 2019 market stats are here! The average sale price for the month was $748,328, up 1.7% compared to January 2018. TREB President Garry Bhaura announced that Greater Toronto Area REALTORS® reported 4,009 home sales through TREB's MLS® in January 2019 – up by 0.6 per cent compared to January 2018. On a preliminary seasonally adjusted basis, sales were up by 3.4 per cent compared to December 2018. "It is encouraging to see the slight increase in January transactions on a year-over-year basis, even with the inclement weather experienced in the GTA region during the last week of the month. The fact that the number of transactions edged upwards is in line with TREB's forecast for higher sales in calendar year 2019," said Mr. Bhaura. The MLS® HPI Composite Benchmark price was up by 2.7 per cent compared to January 2018. The condominium apartment market segment continued to lead the way in terms of price growth. The average selling price was up by 1.7 per cent on a year-over-year basis. After preliminary seasonal adjustment, the average selling price edged lower compared to December 2018. "Market conditions in January, as represented by the relationship between sales and listings, continued to support moderate year-over-year price increases, regardless of the price measure considered. Given housing affordability concerns in the GTA, especially as it relates to mortgage qualification standards, we have seen tighter market conditions and stronger price growth associated with higher density low-rise home types and condominium apartments, which have lower average selling prices compared to single detached homes," said Jason Mercer, TREB's Director of Market Analysis and Service Channels. If you’re thinking of making a move and would like to know how we can help, please contact us for more info. Take a look at the above image. 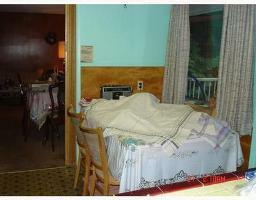 Every now and then a listing pops up on MLS where this is the one and only “photo” used to advertise the property. What are these sellers thinking? More importantly, what is their realtor thinking? Everyone knows that homebuyers use the internet as an information source and visit public sites (like Realtor.ca and agent sites, like ours! ), to search listings and browse photos. Buyers want to see photos, photos, and more photos! As listing agents, a crucial part of our marketing plan involves hiring a professional photographer so that we have an assortment of great pics in our arsenal. Quality photos play an important role in a buyer’s decision to pursue a property or not. Online search tools can produce up to hundreds of listings for buyers to choose from and the quickest way for them to thin the herd is to throw aside anything with bad photos (or worse, no photos at all). 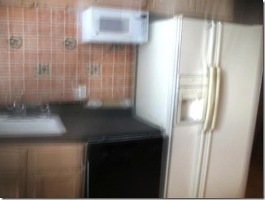 Granted, interior photos of a property may not always be an option. If the home is tenanted the sellers may be limited to using photos of the exterior or, in the case of a condo, photos of the building amenities and the common elements (the gym, rooftop terrace, lobby, etc). Some photos are still better than none. But care should always be taken to use quality images. 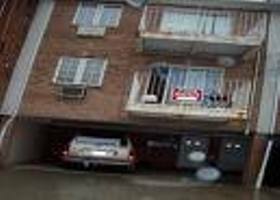 Below are a few choice listing photos we found online. Would any of these make you want to contact the listing agent for more info or visit the open house? If you’re thinking of making a move and would like to know how we can help, contact us for more info. December 2018 market stats are here! The average sale price for the month was $750,180, up 2.01% compared to December 2017. Toronto Real Estate Board President Garry Bhaura announced that Greater Toronto Area REALTORS® reported a total of 77,426 residential transactions through TREB’s MLS® System in 2018. This result represented a 16.1 per cent decline compared to 92,263 sales reported in 2017. Total new listings entered into TREB’s MLS® System were down by 12.7 per cent over the same period to 155,823. Home prices were up very slightly in the City of Toronto and down in the surrounding GTA regions. This dichotomy reflects the fact that the condominium apartment segment, which accounted for a large proportion of sales in the City of Toronto, performed better from a pricing perspective than the detached market segment. The average price for condominium apartment sales across the TREB market area was up by 7.8 per cent year-over-year. “Higher borrowing costs coupled with the new mortgage stress test certainly prompted some households to temporarily move to the sidelines to reassess their housing options. With this said, it is important to note that market conditions were improved in the second half of the year, both from a sales and pricing standpoint,” said Garry Bhaura. “After spiking in 2017, new listings receded markedly in 2018. In many neighbourhoods, despite fewer sales from a historic perspective, some buyers still struggled to find a home meeting their needs. The result was a resumption of a moderate year-over-year pace of home price growth in the second half of the year. Price growth was strongest for less- expensive home types, as many home buyers sought more affordable home ownership options,” said Jason Mercer, TREB’s Director of Market Analysis and Service Channels. . When most people picture themselves shopping for a home they imagine doing so on the weekend, during the day. After all, this is when the majority of open houses happen and it’s generally the easiest time for people to coordinate a couple of free hours. In a busy city like Toronto however, realtors and buyers are out there pounding the pavement at all hours. A lot of my buyer clients find it easiest to meet for viewings during the week, after work. I’ve shown properties as late as 10:30pm on a weeknight. Seeing properties during the evening isn’t much of an issue in the spring or summer when daylight stretches past 8:00pm. In the winter though, when night falls as early as 5:00pm, evening viewings can pose some problems. Natural light is a deal breaker for most buyers. A property that gets plenty of it is always going to outshine (pardon the pun) a property that doesn’t. Knowing how much natural light a property gets (or doesn’t get) is such an important factor in assessing value that it’s foolish not to view the property during the day. Before moving forward with an offer on a property that we’ve seen at night, I always advise my clients that we come back for a second look during the day. Just because a home has windows doesn’t mean the sun’s going to pour in. I’ve seen plenty of houses, condos, and lofts that are dark and dreary on the inside, despite what the exterior might suggest. And what about the view? Staring out the window of a 3rd floor condo into the dark doesn't give you peace-of-mind for what lays beyond. What if the garbage bins are sitting directly under the balcony? Worse still, what if there's a hole in the ground where a new condo will soon stand? (Of course, if your realtor is worth their salt they'll know about that new condo...). I know that you're busy and evenings may be the only time you can squeeze in some viewings. Do yourself a favour though - take an extra long lunch the next day and go back for a second look. It's only the largest purchase of your life. November 2018 market stats are here! The average sale price for the month was $788,345, up 3.5% compared to November 2017. Toronto Real Estate Board President Garry Bhaura announced the continuation of moderate price growth in November 2018 compared to November 2017. 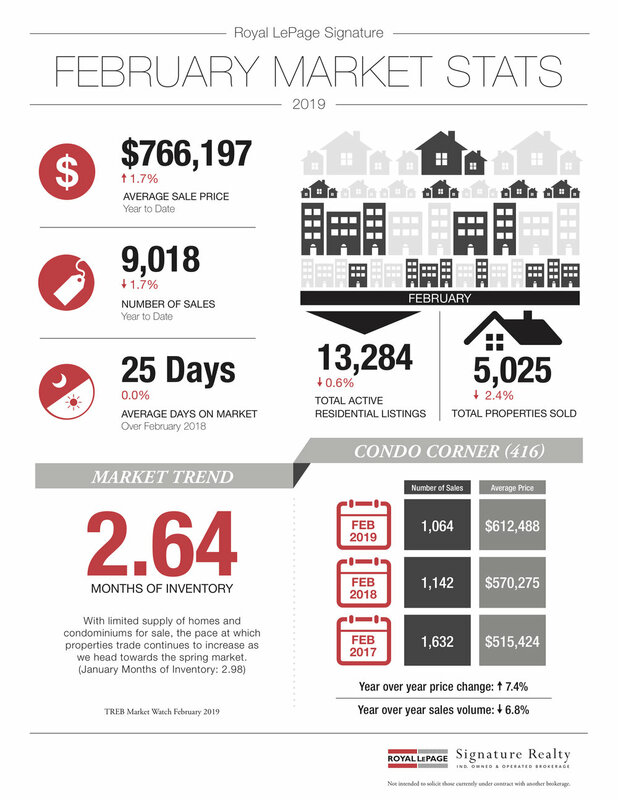 The MLS® Home Price Index (HPI) Composite Benchmark was up by 2.7 per cent year-over-year. The average selling price was up by 3.5 per cent year-over-year to $788,345. Greater Toronto Area REALTORS® reported 6,251 residential transactions through TREB's MLS® System in November 2018. This result was down by 14.7 per cent compared to November 2017, when we saw a temporary upward shift in demand as the market was distorted by the looming OSFI-mandated stress test at the end of last year. "New listings were actually down more than sales on a year-over-year basis in November. This suggests that, in many neighbourhoods, competition between buyers may have increased. Relatively tight market conditions over the past few months have provided the foundation for renewed price growth," said Mr. Bhaura. October 2018 market stats are here! The average sale price for the month was $807,340, up 3.5% compared to October 2017. Greater Toronto Area REALTORS® reported 7,492 sales through TREB's MLS® System in October 2018 – a six per cent increase compared to October 2017. On a preliminary seasonally adjusted basis, sales were down by one per cent compared to September 2018. The average sale price for October 2018 was up 3.5 per cent on a year-over-year basis to $807,340. After preliminary seasonal adjustment, the average selling price was up one per cent compared to September 2018. The MLS® Home Price Index (HPI) Composite Benchmark was up by 2.6 per cent compared to October 2017. Price growth continued to be driven be the condominium apartment and higher density low-rise market segments. There were 14,431 new Listings entered into TREB's MLS® System in October 2018 – down 2.7 per cent compared to October 2017. The fact that sales were up and new listings were down year-over-year in October suggests that market conditions became tighter. Does My Deposit Cheque Need To Be Certified? In every MLS listing there’s a section towards the bottom for “broker’s remarks” (note: these remarks aren’t available on the public versions of listings). It’s in this section where listing agents will specify things like showing restrictions, offer dates, etc. And it’s here that we’ll often see the instruction, “deposit to be certified”. 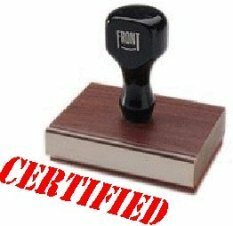 Why Does The Seller Want My Deposit Cheque To Be Certified? A seller wants a certified cheque because it gives them greater peace-of-mind than a standard personal cheque does. 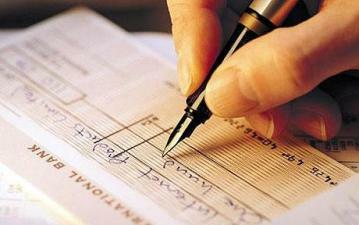 The buyer went to the trouble of walking into a bank and paying $5.00 - $10.00 to have the cheque drawn up. The buyer is serious and is submitting their offer with the genuine intent of purchasing. The buyer does indeed have the deposit funds available. The cheque can be deposited immediately into the Listing Brokerage’s trust fund and there’s no worry as to whether or not the funds will clear. It's just that a certified cheque holds more weight in most sellers' eyes. In a seller’s market, where buyers are doing everything they can to set their offer apart from the competition, having the deposit certified is a must. I’ve seen a buyer with the highest offer actually lose out to someone with a lower offer simply because the lower offer came with a certified deposit cheque. In this case, the seller wanted to rest easy that night knowing that it was a done deal and he was willing to pay (in the form of selling for a bit less) for that peace-of-mind. Can I Provide A Bank Draft Instead? In my experience, a bank draft is just as good as a certified cheque. I’ve never had a listing agent show preference of one over the other and both seem to hold the same weight with sellers. And bank drafts are sometimes a bit cheaper/easier to obtain (be sure to check with your banker which option is best for you). September 2018 market stats are here! The average sale price for the month was $796,786, up 2.9% compared to September 2017. Toronto Real Estate Board President Garry Bhaura announced that Greater Toronto Area REALTORS® reported 6,455 sales through TREB's MLS® System in September 2018 – up 1.9 per cent compared to September 2017. The average selling price for September 2018 sales was up by 2.9 per cent over the same period to $796,786. The MLS® HPI composite benchmark price was up by two per cent year-over-year. New listings entered into TREB's MLS® System in September 2018 amounted to 15,920 – down by 3.1 per cent compared to September 2017. With sales up year-over-year and new listings down, market conditions became tighter. Many buyers may have found it more difficult to find a home meeting their needs. "It is healthy to see sales and prices in many areas across the Greater Toronto Area up a bit, compared to last year's lows. At the same, however, it is important to remember that TREB's market area is made up of over 500 communities. Market conditions have obviously unfolded differently across these communities. This is why it's important to work with a REALTOR® who is familiar with local market conditions in your areas of interest," said Mr. Bhaura. "While higher borrowing costs and tougher mortgage qualification rules have kept sales levels off the record pace set in 2016, many households remain positive about home ownership as a quality long-term investment. As the GTA population continues to grow, the real challenge in the housing market will be supply rather than demand. The Toronto Real Estate Board is especially concerned with issues affecting housing supply as we move towards municipal elections across the region," added Mr. Bhaura. On a monthly basis, after preliminary seasonal adjustment, sales edged up by 0.2 per cent in September 2018 compared to August 2018. The average selling price, after preliminary seasonal adjustment, edged lower by 0.5 per cent month-over-month. "Generally speaking, annual rates of price growth have been stronger for higher density home types in 2018, including condominium apartments, townhouses and semi-detached houses. In many neighbourhoods, these home types provide more affordable home ownership options. This is why a policy focus on increasing mid-density housing options throughout the GTA is important," said Jason Mercer, TREB's Director of Market Analysis. An offer-to-purchase real estate is made up of many elements, some of which are arguably more important than others. In most cases, price sits at the top of the list. And of course, one of the most important elements of an offer – the deposit. The deposit forms a few key functions. First, it shows good faith on the buyer’s part and gives the seller peace-of-mind that the person they’re dealing with is qualified and sincere. Secondly, the deposit amount is applied to the purchase price of the home when the sale closes. How Much Should The Deposit Be? There’s no set amount when it comes to real estate deposits, but 5% of the purchase price is generally a good rule of thumb. Having said that, I’ve seen deposits of less than 5%, especially when it comes to first-time buyers (eg. $20,000 on a $500,000 property). Deposits of greater than 5% are not out of the ordinary either. We see these often in multiple-offer scenarios, where buyers are doing everything they can to give themselves the upper hand over their competition. The pre-printed deposit section of an Agreement of Purchase and Sale gives three options for when the deposit is to be paid: Herewith, Upon Acceptance, or as otherwise described in this Agreement. You can see that "Upon Acceptance" means that the deposit is to be delivered to the Deposit Holder (most often the Listing Brokerage) within 24 hours of the acceptance of the Agreement. "Herewith" is just as it sounds, the deposit is submitted along with the offer. "As otherwise described in this Agreement" can mean a few things. The buyer and seller may agree, for example, that the deposit be delivered within 48 hours (as opposed to 24 hours). Or they may agree to an initial deposit PLUS subsequent additional deposit(s) upon removal of conditions. For example, the buyer will fork over $10,000 now and then an additional $5,000 once they secure financing. Aside from "How Much?" and "When? ", another common question I get from buyers is, "Does My Deposit Cheque Need To Be Certified?" This is a great question... Stay tuned for a future blog post in which I'll give the answer. August 2018 market stats are here! The average sale price for the month was $765,270, up 4.7% compared to August 2017. Toronto Real Estate Board President Garry Bhaura announced sales and price increases on a year-over-year basis in August. Greater Toronto Area REALTORS® reported 6,839 sales through TREB’s MLS® System in August 2018 – an 8.5 per cent increase compared to August 2017. Both the average selling price, at $765,270, and the MLS® Home Price Index Composite Benchmark for August 2018 were up compared to the same month in 2017, by 4.7 per cent and 1.5 per cent respectively. The average selling price increased by more than the MLS® HPI Composite due, at least in part, to a change in the mix of sales compared to last year. Detached home sales were up by double digits on a year-over-year percentage basis – substantially more than many other less-expensive home types. Month-over-month sales and price growth also continued in August. On a preliminary seasonally adjusted basis, August 2018 sales were up by two per cent compared to July 2018. The seasonally adjusted August 2018 average selling price was down slightly by 0.2 per cent compared to July 2018, following strong monthly increases in May, June and July. More often than not, they’ve haven’t. Don’t get me wrong – this preliminary leg work is great in that it gives you a ballpark idea of what you’re in the market for. It’s not the same as having an actual pre-approval though. Generally, you can get pre-qualified for a mortgage over the phone or online. You provide a breakdown of your employment history, your income, a list of assets and liabilities, and an approximate down payment amount. Based on this info, your mortgage broker will let you know how much you’re pre-qualified to spend and what sort of interest rate they can offer you. An actual pre-approval is a bit different. It takes the process a step further by having you complete a mortgage application and provide your mortgage broker with the necessary documentation to verify the info provided in your pre-qualification (income verification letter from employer, banking info, proof of financial assets and liabilities, source and amount of down payment and deposit, proof of source of funds to cover closing costs, etc.). There no sense in shopping for a Jalopy if you can easily afford a Jaguar. By the same token, why waste your time on a Jaguar if you’re really in the market for a Jeep? A mortgage pre-approval gives buyers a firm budget to work with. It helps to streamline the home searching process and allows us to focus specifically on those properties that are within reach. A mortgage pre-approval locks in a current interest rate for you, for a period of a few months. If rates start to increase while you’re out shopping for a home, you’re guaranteed the original, lower rate. If rates actually go down while you’re out shopping, you’ll get the new, lower rate. It’s common knowledge that the Toronto real estate market can be highly competitive, especially for buyers. 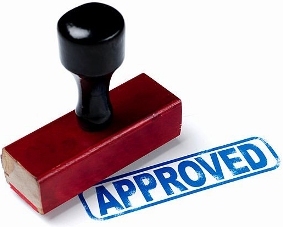 It helps when I can tell sellers that my buyer clients have been pre-approved. It gives the sellers some peace-of-mind and reassures them that they’re dealing with serious, qualified purchasers. And of course being pre-approved helps when there are multiple offers. Sellers are much more likely to work with an offer that doesn’t have a financing condition in it. I've actually seen sellers reject the highest priced offer because it had a financing condition in it and accept a lower priced offer because it didn't. A mortgage pre-approval is key in giving you the power to act quickly and confidently when the right property comes along. July 2018 market stats are here! The average sale price for the month was $782,129, up 4.8% compared to July 2017. Toronto Real Estate Board President Garry Bhaura announced strong growth in the number of home sales and the average selling price reported by Greater Toronto Area REALTORS® in July 2018. “Home sales result in substantial spin-off benefits to the economy, so the positive results over the last two months are encouraging. However, no one will argue that housing supply remains an issue. The new provincial government and candidates for the upcoming municipal elections need to concentrate on policies focused on enhancing the supply of housing and reducing the upfront tax burden represented by land transfer taxes, province-wide and additionally in the City of Toronto,” said Mr. Bhaura. Residential sales reported through TREB’s MLS® System for July 2018 amounted to 6,961 – up 18.6 per cent compared to July 2017. Over the same period, the average selling price was up by 4.8 per cent to $782,129, including a moderate increase for detached home types. New listings in July 2018 were down by 1.8 per cent year-over-year. Preliminary seasonal adjustment pointed to strong month-over-month increases of 6.6 per cent and 3.1 per cent respectively for sales and average price. Seasonally adjusted sales were at the highest level for 2018 and the seasonally adjusted average price reached the highest level since May 2017. The MLS® Home Price Index (HPI) Composite Benchmark for July 2018 was down slightly compared to July 2017. However, the annual growth rate looks to be trending toward positive territory in the near future. “We have certainly experienced an increase in demand for ownership housing so far this summer. It appears that some people who initially moved to the sidelines due to the psychological impact of the Fair Housing Plan and changes to mortgage lending guidelines have re-entered the market. Home buyers in the GTA recognize that ownership housing is a quality long-term investment,” said Jason Mercer, TREB’s Director of Market Analysis. June 2018 market stats are here! The average sale price for the month was $807,871, up 2.0% compared to June 2017. Toronto Real Estate Board President Garry Bhaura, in his first market release as TREB President, is pleased to announce some positive signs with respect to the housing market. Greater Toronto Area REALTORS® reported 8,082 home sales through TREB’s MLS® System in June 2018 – up 2.4 per cent compared to the low June 2017 result. After preliminary seasonal adjustment, sales were also up 17.6 per cent on a monthly basis between May 2018 and June 2018, continuing the trend of somewhat volatile month-over-month changes over the past year as home buyers reacted to various policy changes impacting the market. “Home ownership has proven to be a positive long-term investment. After some adjustment to the Fair Housing Plan, the new Office of The Superintendent of Financial Institutions (OSFI) stress test requirement and generally higher borrowing costs, home buyers are starting to move back into the market, with sales trending up from last year’s lows. Market conditions appear to be tightening, with sales accounting for a greater share of listings, as new listings have dropped compared to last year,” said Mr. Bhaura. The average selling price edged up by two per cent on a year-over-year basis to $807,871 in June 2018. After preliminary seasonal adjustment, the average selling price was also up by 3.3 per cent month-over-month between May 2018 and June 2018. The MLS® Home Price Index (HPI) was down by 4.8 per cent on a year-over-year basis, but remained basically flat month-over-month. The difference in the year-over-year rates of change between the average price and the MLS® HPI was likely due, at least in part, to a change in the mix of properties sold in June 2018 compared to June 2017, with low-rise home types accounting for a greater share of sales in June 2018. “The expectation is to see improvement in sales over the next year. Over the same period, however, it is likely that issues surrounding the supply of listings will persist. This suggests that competition between buyers could increase, exerting increased upward pressure on home prices. With a new provincial government in place and municipal elections on the horizon, housing supply should be top-of-mind for policy makers,” said Jason Mercer, TREB’s Director of Market Analysis and Service Channels. In a seller’s market, where demand outweighs supply and properties often receive multiple offers, buyers need to do everything they can to give themselves the upper hand. One of the most powerful ways to strengthen their position when competing with other buyers is to submit a firm offer-to-purchase. Think about it - if you’re a seller with two offers in front of you and one of them is conditional upon the buyer arranging financing and the other one isn’t (all other things being equal), which one are you going to go with? Accepting a firm offer means there’s no waiting period to suffer through with the possibility that the buyer will walk away from the deal. A firm offer means you can go to bed that night knowing that you’re property is sold and it’s a done deal. Peace-of-mind like this carries a lot of weight. Keep in mind though; submitting a firm offer is not to be taken lightly. Preparation is key and there’s work to be done ahead of time by the buyer, their realtor, their mortgage broker, and possibly their lawyer. Obtaining a mortgage pre-approval is crucial, but it’s not worth much if your broker is surprised with significant details when the time comes to actually arrange the financing (eg. “I forgot to mention that I’ve got a $30,000 student loan I’m slowly chipping away at.”). Be sure to provide accurate income and debt figures so that your pre-approval is solid and you can comfortably go in without this condition. If the sellers are "holding-back" on offers, get in there and have a home inspection done prior to the offer date. Yes, it’s going to cost you approx $600.00 and you may not even end up getting the property. But six hundred bucks is peanuts compared to the hundreds of thousands (or more!) you’ll be dropping on your home purchase. Having the inspection done ahead of time will allow you to come to the table sans condition and give you a better shot at sealing the deal. A number of sellers will actually have their own “pre-listing” home inspection done ahead of time and the results will be made available to all prospective buyers. The best case scenario here is that the seller has already obtained a current Status Certificate and copies are made available to all prospective buyers for their lawyers to review prior to the offer date. If the docs are not available ahead of time, the buyer and their realtor need to have a discussion about the risks of submitting a firm offer without seeing the Status Certificate. There is some homework that the realtor can do to give their client some peace-of-mind in this area, but it needs to be clear that there are still risks involved and nothing can substitute for a lawyer's thorough review of the documents. Succeeding as a buyer in a seller's market is hard work. There's plenty of competition out there right now and you need to find every advantage you can. Being able to submit a firm offer certainly tips the scales in your favour. If you’re thinking of making a move and would like to know how we can help, please to contact us for more info. May 2018 market stats are here! The average sale price for the month was $805,320, down 6.6% compared to May 2017. Greater Toronto Area REALTORS® reported 7,834 sales through TREB’s MLS® System in May 2018. This result was down by 22.2 per cent compared to May 2017. While the number of sales was down year-over-year, the annual rate of decline was less than reported in February, March and April, when sales were down by more than 30 per cent. On a month-over-month basis, seasonally adjusted May sales were basically flat compared to April. Supply of homes available for sale continued to be an issue. New listings were down by 26.2 per cent. The fact that new listings were down by more than sales in comparison to last year means that competition increased between buyers. Recent polling conducted by Ipsos for TREB suggests that listing intentions are down markedly since the fall. The MLS® Home Price Index (HPI) Composite Benchmark was down by 5.4 per cent year-over- year. The average selling price for all home types combined was down by 6.6 per cent to $805,320. On a seasonally adjusted basis, the average selling price was up by 1.1 per cent compared to April 2018. April 2018 market stats are here! The average sale price for the month was $804,584, down 12.4% compared to April 2017. Toronto Real Estate Board President Tim Syrianos announced that Greater Toronto Area REALTORS® reported 7,792 sales through TREB’s MLS® System in April 2018. The average selling price was $804,584. On a year-over-year basis, sales were down by 32.1 per cent and the average selling price was down by 12.4 per cent. The year-over-year change in the overall average selling price has been impacted by both changes in market conditions as well as changes in the type and price point of homes being purchased. This is especially clear at the higher end of the market. Detached home sales for $2 million or more accounted for 5.5 per cent of total detached sales in April 2018, versus 10 per cent in April 2017. The MLS® Home Price Index strips out the impact of changes in the mix of home sales from one year to the next. This is why the MLS® HPI Composite Benchmark was down by only 5.2 per cent year-over-year versus 12.4 per cent for the average price. “While average selling prices have not climbed back to last year’s record peak, April’s price level represents a substantial gain over the past decade. Recent polling conducted for TREB by Ipsos tells us that the great majority of buyers are purchasing a home within which to live. This means these buyers are treating home ownership as a long-term investment. A strong and diverse labour market and continued population growth based on immigration should continue to underpin long-term home price appreciation,” said Mr. Syrianos. “The comparison of this year’s sales and price figures to last year’s record peak masks the fact that market conditions should support moderate increases in home prices as we move through the second half of the year, particularly for condominium apartments and higher density low-rise home types. Once we are past the current policy-based volatility, home owners should expect to see the resumption of a moderate and sustained pace of price growth in line with a strong local economy and steady population growth,” said Jason Mercer, TREB’s Director of Market Analysis. Get the latest Toronto real estate news & updates. You’re now subscribed to our newsletter and you’ll receive the next edition when it comes out.